I am in Namibia, 350km northwest of the once colonial centre of German West Africa, Windhoek; on the edge of the 2000km Namib Desert – the oldest in the world I’m told. From the setting sun my gaze drifts north and way down to the road at the toe of this great tailings hill. The air is finally cool after the burning African sun, but the earth still hot under sandaled feet. Across the road is the hamlet-town of Uis – or `Bitter Water’ – once home to 3600 souls, downgraded to a mere `settlement’ in 2010. Away to the west is The Skeleton Coast, littered with the bones of forgotten mines and over 100 shipwrecks on a desolate coast: beached skeletons the wrecks of stranded wooden whales, casualties of a coast forever haunted by eerie phantom mists. But something has broken my friend’s train of thought, his soft voice trailing away to nothing. He stares down the straight strip of a road to the western end of town and I follow his line of sight. I see only dust and desert scrub. William’s outstretched arm and finger reveal no more, but I’m told there are eleven unmarked mounds down there, somewhere. Try as I may, I can’t see a thing from way up here. This town is a mining town – or once was – the world’s biggest tin mine. I turn from the neat cluster of distant town houses and street trees below, to back behind me: a gaggle of roofless empty shells, what’s left of the mine buildings nestled between the folds and valleys of moonscape mountains of tailings. With a fall in the price of tin, the mine shut in the early 1990’s, the 3600 inhabitants leaving when the `village’ was officially downgraded, then more recently bought lock-stock-and-barrel by a South African businessman. Where we stand is the top of a single white tailings dune that towers over all others, a familiar landmark in these parts. With the red glow of the sun finally finished, we head down a curving, breakneck road, to one side a man-made cliff. My clapped-out pickup brakes squeal, and the gears clunk. I pull at the wheel this way and that. Talcum-like dust clouds leak inside and catch in my throat. At the bottom we cross the main road to a great crater of a hole. 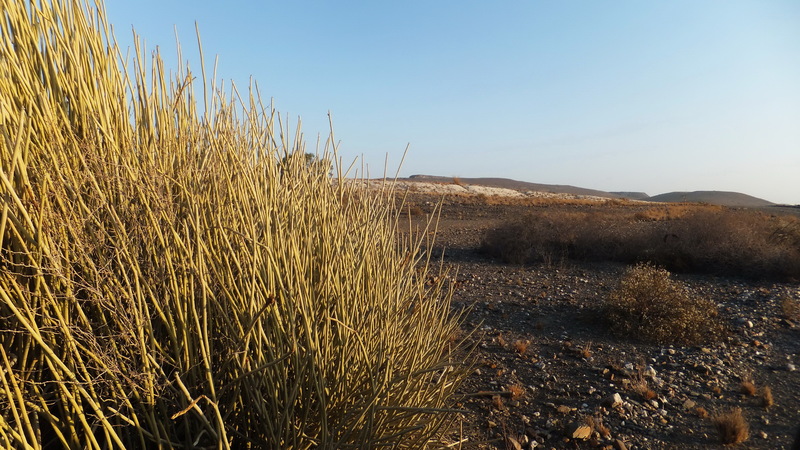 William tells me the tin was taken from here, the man-made abyss now filled with water – oddly incongruous in a fearsome dry land of endless straight roads, the most famous inhabitant the occasional 2000yr old oddity of a plant with two lonely leaves invariably shredded by Namib dust devils. William lives alone in the old African ‘township’ just east of Uis `proper’, a dusty segregated legacy of apartheid days. He is quiet for a guide – works two weeks on, two weeks off. He shares the job with others, “Jobs are precious here… always have been.” He travels by donkey and cart 50km to his family’s village weekly, rainbow-coloured but rusted tin sheds that sit in the shadow of the Brandberg, the highest mountain in Namibia, and a special place where thousands of prehistoric paintings are tucked in ragged nooks and crannies. “The Germans ‘discover’ the paintings in 1918, but there is no respect here.” William says, and shakes his head. Those eyes narrow. “Yah… you splash your Coca Cola on the most famous…`The White Lady’… to see the painting better with your own white eyes… and this painting, he is fading with the years… for `he’ is not a lady, but a shaman… a holy man for us.” William purses his lips. “But your eyes see what you want to see. And your Coca Cola damage, it cannot be fixed.” I feel embarrassed for what has taken place here. William places a hand on my shoulder, and there is just the hint of a smile. “Our people know of these paintings of course Sir… for over 20,000yrs we have known. But for your people, everything is new.” His eyes meet mine and he shakes his head. But William is optimistic. He must be, he says. He has three kids. He sees a future in welcoming worldly but wayward tourists like me. There are now hot air balloon rides to take in the rugged expanse of this place, and the tourists want to see the desert elephants that follow ancient winding riverbeds. And William knows how to find them. “These elephants are special”, he says, “living in small groups only, digging for water. The legs, they are longer than other elephants Sir, because of the distance they must travel to survive.” He nods when I ask if he would show me. “Yah… we may be lucky Sir”, he says. We wait for our animal to move safely off to the side. Around yet another bend we are surprised to come across two fully-grown females in the fading afternoon light, just over in the bush, not ten metres away with one young calf tucked between. My luck has held good and we watch for an hour until they disappear in the dark. In the morning I drop by the African township store and buy some kids’ clothes from a Chinese trader; a parting gift for William’s family. I leave them with a German friend of William’s who runs a hot air ballooning business in Uis, and then head for The Skeleton Coast. At the edge of town there is a cloud of dust as I pull over and gaze back at the flickering town lights for one last time. I smell wood-smoke and hear the yap of distant village dogs, and I wonder if this is the place William could see from atop the tailing mountains. Jumping from my truck I slam the door shut, tramping off into the gloom until I see the mounds. Yes, there are eleven simple unmarked graves, the occasional rock, the earth bare and red. There is an ominous silence, the distant village suddenly quiet. Surrounding sentinels are clumps of Melkbos; a Namibian bush of 2m tubular grass-like uprights, the central stump of a trunk hidden somewhere deep within. I stare down at the mounds and walk to the nearest bush where I break off a frond that bleeds a milky, latex ooze that is sticky between thumb and forefinger. I shake my hand to try and rid myself of the sticky mess, then wipe my fingers in the red sandy dirt. I rub more dirt between my hands until the stuff is finally gone, my hands now a dust-laden bloody red, I empty my drink bottle and rub some more, then wipe my hands on my already grubby pants. I imagine a cooking fire, their meat all finished, their stomachs finally full, the men laying close for comfort and warmth. Their meagre blankets are thin, clothes threadbare. Eventually the time approaches midnight, they fall into a fitful sleep, one by one, by one. The fire blazes and crackles, the encircling bushes oddly claustrophobic. Dark shadows flicker and creep, the smoke seeping in silent perfumed drifts. Northwards there is the darkening, forever horizon and – I imagine – their somewhere homeland. I stare into the engulfing darkness, then down at my dusty feet and the surrounding ground all around me the bare mounds of dirt. 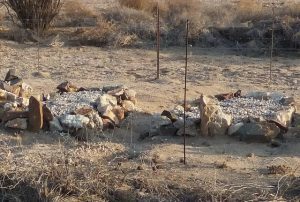 I imagine the buried bones, of eleven unknown young men that chose this resting place over any other in this vast dry land. These men know nothing of these parts, chatting and toasting their strips of meat until finally bedding down exhausted, sleeping rough below a timeless starry sky, eleven weary travellers desperately seeking work, eleven young men warming themselves on a fire fuelled by hacked clumps of surrounding `Melkbos’ – the most toxic of bush – eleven young men poisoned in their sleep, the families left grieving but knowing nothing of the fate of their dead kith and kin. You have come this far, so why not Leave a Comment?